With the new year in full swing and with new podcasts popping up all around, it can sometimes be a daunting task to find fresh life in your own podcast. But fear not! There’s nothing that a little podcast revamp can’t do to give you a new skip in your podcasting step. So let’s jump into a few strategies that you can implement today to give your podcast the leg up that it needs – a makeover for the new year! If you feel like things have become a bit stagnant on your show, now is the time to change it up! One of the simplest places to start is with the format of the show itself. Now of course, there may be certain types of questions that are integral to the identity of your podcast so there is no need to remove those. However, you can certainly add in some new ones to grab the attention from your listeners and give them something new to look forward from guest interviews. Another great way to change up the format is by introducing new bonus episodes. These can be short thought of the day episodes, an episode dedicated solely to answering listener questions or even add a new segment to your episodes. On top of that, if you aren’t already, invite a guest to be featured on your show. This is a great way to bring some new perspective into the conversation and give your listeners fresh content to look forward to. Take a personal refresh – when you feel refreshed, your creativity will flow much better, and listeners will feed off of your rejuvenated energy. First, start with something small by simply changing up your recording space. Rearrange your office furniture, add in some new visual elements, or just change up your view. Research shows that having a view of the outside or adding plants into your home and office space can boost your mood, and give you a renewed energy. Another great way is to create a new recording routine. This can mean recording your podcast at different times of the day. Find out which time makes you feel more energized or see if other times work better today than they used to in the past. On top of this, perhaps it’s time to implement a new pre-recording routine. This can be a simple as going for a walk, spending a few minutes doing creative writing, or just winding down with one of your favorite podcasts for some new inspiration. As your podcast grows, you are bound to gain new listeners along the way. This is a great opportunity to repurpose old content such as popular episodes that new listeners may not yet have had a chance to listen to. These episodes can either be released as bonus episodes, or you can simply turn them into a downloadable PDF with a clear outline and takeaways that listeners can implement today. These new, refreshed pieces of content can be used throughout your online platforms, including on social media channels and on the podcast blog. 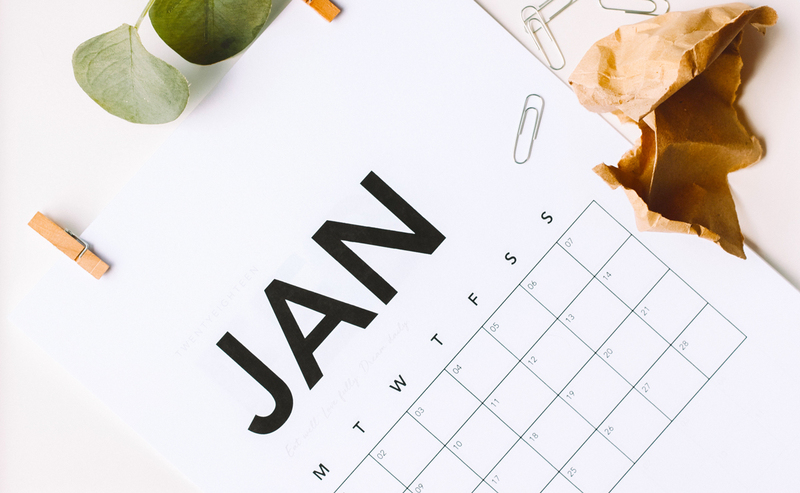 Since this is a new year refresh, another great way to repurpose your content is to do a roundup episode or blog post to showcase some of your most popular episodes from the previous year. This is a great way to give your audience a recap of all the incredible guests you had on, and the most important lessons that you really want them to take with them into the new year. Sometimes, as podcasters, we can get a little too attached to our intro and outro. But guess what? That is the one thing that listeners tend to totally skip over, especially if it is the same old tune as always! So why not change it up for the new year? Adding in some fresh intro music that keeps the original feel of the podcast is a great way to grab listeners’ attention and give them something new to look forward to. Now this change up may take a bit more work initially, but what better time to do it than the start of a new year! Another great thing to add in is a renewed call to action for your listeners. Generating honest listener reviews for your podcast should never end up on the back-burner. With the new year on the roll, remind your audience to head over to their favorite podcast apps and leave a review. You can even add in a little contest or incentive to remind then to do it! If you are launching a new course or opening up a new online community, a call to action is a great way to give those some exposure. Get creative, and give your audience some new action steps to take! There’s no better way to breathe some fresh life into your podcast than by getting your audience more engaged! Without your listeners, your podcast really wouldn’t be what it is today. Your purpose is to create amazing content for your audience, answer their questions, and help them accomplish exactly what they’ve set out to do. The best way to get started is by launching a giveaway or contest. This draws your audience in, encouraging them to participate in something that everyone in your podcast community is passionate about. The prize can be anything you imagine, whether it’s something specific to your audience or just something fun! Another way to up audience engagement is to introduce a new Q&A type format. This can be added as an additional segment in your podcast or it can be a whole new episode on its own. Since a podcast can be such a one-way conversation sometimes, having this Q&A section allows your listeners to submit their questions and helps you to better answer and cover specific topics they want to learn more about. This Q&A can be a lot more informal and fun, which opens up another opportunity – invite an audience member to co-host! This can be a great chance for a lucky listener to run the show with you or even share their own story. When it comes to giving your podcast some new life, there’s nothing better than giving it life beyond the podcast. Doing this is simple; create a podcast community! More often than not, people simply want a place that they can connect with others who share a similar outlook on life. Providing a space where your listeners can come together not only helps to grow your podcast, but also helps your audience find a place to belong. You can do this by launching a Facebook group for the podcast where listeners can share ideas, ask questions, and discuss episodes even further. Another great way to build a community beyond the podcast is by doing live streaming events. This gives your listeners yet another way to stay connected to you and the podcast by tuning in to these “bonus” events. Live streaming can be done through Facebook, Instagram, or even YouTube. Listeners can tune in and ask you questions right on the spot. These videos can then be saved and repurposed as content later on. Finally, there’s really nothing better than that face-to-face connection when building a podcast community. Hosting a podcast meetup is a great way to get your listener community together and give them yet another opportunity to connect over a shared interest. Meetups can be informal gathers or you can even go as far as to organize a conference where your listeners can buy tickets to see your guests present on their specialty topics and even do a workshop to boot! The options are really endless, and it is just up to you to get the ball rolling and make things happen for your podcast and your community.